The Higgs boson was the last particle of the Standard Model (SM) to be experimentally confirmed. In July 2012, the ATLAS and CMS experiments at CERN announced the discovery of a new boson at a mass of roughly 125 GeV which was compatible with the long-awaited Higgs boson. The SM does not say how heavy the Higgs boson is. However, for a given Higgs mass the SM predicts how often it is produced in particle collisions and how it decays to the known particles. 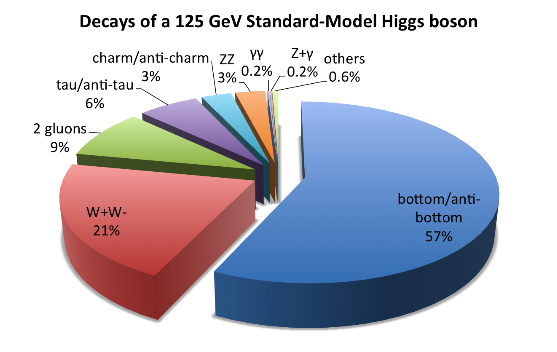 The following chart summarizes how often a 125 GeV Higgs decays to various final known particles. Sådan en Higgs boson er meget tung, endda tungere end Z bosonen som du før har mødt, og den har en meget kort levetid og kan derfor kun flyve en meget kort afstand. Der er derfor ikke nogen mulighed for at observere den direkte i ATLAS eller i nogen anden partikel detektor. The Higgs boson can be produced at high-energy proton-proton collisions at the LHC. ATLAS and CMS have observed decays to (i) 2 Z bosons, leading to two pairs of charged leptons, to (ii) 2 photons, and to (iii) 2 W bosons, leading to 2 charged leptons and 2 neutrinos. Decays of the Higgs boson to tau lepton pairs has also recently been observed. I Z-stien har du muligheden for at lede efter Higgs henfald af typerne (i) og (ii) og delvist gentage hvad ATLAS fysikerne har gjort på CERN! The particle discovered by ATLAS and CMS in 2012 is now usually referred to as "the Higgs boson". Several properties, including the spin, have been measured, and they are consistent with the Standard Model predictions. The decay of the Higgs boson to a pair of tau leptons has been observed, but the decay to a pair of bottom quarks remains to be confirmed. Men hvorfor er det de ”sjældne” henfald, som fx H→γγ (med 0,2% sandsynlighed) som er observeret, men ikke de meget ”hyppigere” henfald H→bb̅ (med 57% sandsynlighed)? Det sidste henfald af Higgs bosonen fører til to jets af partikler som er meget svære at skelne fra den meget hyppigere produktion af normale jets, som foregår gennem den stærkeste af alle vekselvirkningerne - den stærke kraft. If you are patient you will, hopefully in future Masterclasses, study such Higgs decays. For now, good luck with your search for the Higgs boson in decays to ZZ and γγ. Isn’t it marvelous that data which were used to discover the Higgs boson are available for you to analyze? Følg dette link, hvis du vil vide mere om Higgs partiklen. I Standard Modellen er det Higgs feltet, der er ansvarligt for partiklernes masser. Til dette felt svarer Higgs bosonen, som er en partikel med spin 0. Det er den boson vi har søgt efter ved LHC!